Hartley Hill, which links Church Road and Hartley Bottom Road, is one Hartley's ancient roads. 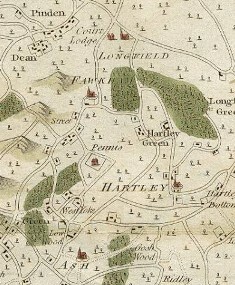 It appears on the first map of Hartley in 1769, but was also mentioned as the "king's highway" in a 1633 deed as the highway from Hartley to Ash. This was because it was once a longer road which continued from Hartley Hill Cottage to New Ash Green. It's current shortened state dates from just after the war. On the northern side at the top is Hartley Hill Cottage. 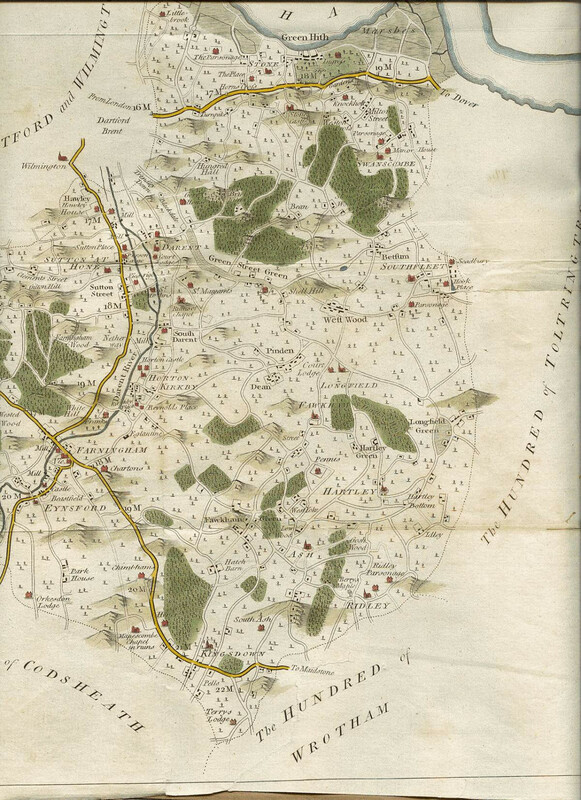 Next are a collection of fields which once was one large field called East Eolly - mentioned as Eyleye in a survey of the lands of the manor in 1392. At the foot of the road is Bridelands Wood and finally, Hartley Bottom Farm. Bridelands was also mentioned as Brydone in the 1392 Manor Survey. There are a few houses on the southern side - Gossey Croft, Long View and Hillside. Gossey Croft commemorates the field of that name, first mentioned in 1609 as being part of land owned by William Kipps. At the foot of the hill is the former Hartley Car Breakers (in Ash parish), it looks like the site will eventually be used for one large house. The car breakers began as Baldwin's Motor and Trailer Works in about 1972, and the site is still called Baldwin's Yard. There have been attempts to build other houses here, most notably in 1961 when the council refused an application to build 15 houses at Hillside. It appears the road was first tarmaced in 1927. Hartley Hill: (L) Longview (R) looking north from road towards Foxborough Wood.